I've never seen a dragon boat race but looks like great fun. I bet they are very fun and interesting to watch! I love this photo. This is a beautiful shot. I bet it's fun to watch them. I have watched similar race in Switzerland! It was fascinating indeed. Cheers from NYC..
Have never gone, but fun to watch on TV. Cannot imagine how they stay in sync, but then that's probably why the practice sessions. :) Thanks for sharing. So very cool. I remember when I use to dragon boat race. So much fun. Thanks for sharing and bringing back memories. Great photo = the water was quieter the day we had lunch there. Pity! Nice to meet you again at WednesdayAroundTheWorld... great capture! Love this photo - so colorful and crisp and clear! I never saw any boat race . 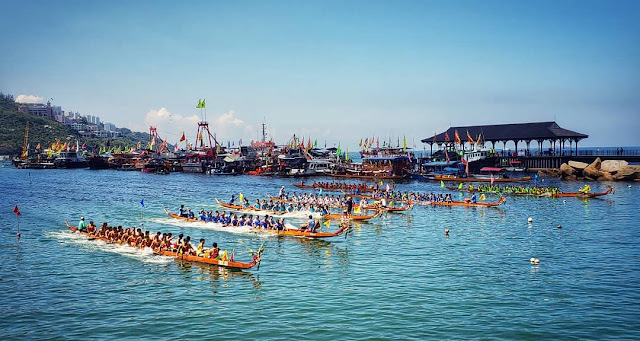 Because here ( India) Dragon boat race is not common.